Now that you have narrowed down the direction you want to go in, setting goals and making a plan will improve your chances of getting there. People who set and finish career goals tend to get more done and often earn more money than people who don’t set goals. Some people used to rely on their boss or company to give them chances to advance. Now it is up to you. If you don’t make it happen for you, no one else will. In today’s world of work, you need to take charge of your own career. You Relate to Others as Equals: There is more of a “team” mindset in the work place. Supervisors’ roles have changed from "parent" to "coach.” You joined the team voluntarily and can leave any time. You can leave when you are ready. You also know that an employer can ask you to leave at any time. You Find Greater Joy in Work: You can choose work that you find interesting. Since very few jobs offer real security, why not do what you love? You Keep Growing: To keep growing, you need to expand your skills and add to your knowledge. You need to build relationships with coworkers and others in your field. You must be flexible and able to adapt to changes in your work. You must be able to transfer your skills to different types of work. Think about what you want. Now make a plan that will get you where you want to go. 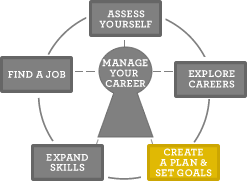 Using the Career Plan Worksheet (pdf) to help you meet your goals.